Latin America & Caribbean Latin America & Caribbean Who supports Brazil's far-right candidate Jair Bolsonaro? Brazilians are voting for a new president on Sunday and opinion polls suggest the far-right candidate, Jair Bolsonaro, has a commanding lead. Which are the groups supporting him and why? For many Brazilians, tackling violence is the number one priority. Mr Bolsonaro has put tackling crime at the centre of his campaign. Last year, there were a record 63,880 murders in Brazil, and his supporters say violence has got out of hand. Mr Bolsonaro wants to liberalise gun laws, reduce the age of criminal responsibility to 16 and give more powers to the police to shoot criminals. Alessandra Uberaba lives in Tijuca, a neighbourhood of Rio de Janeiro where drug and street violence have been on the rise. "People don't go out at night anymore," Ms Uberaba says. "The people in the building I live in have been robbed at gunpoint, we live with this fear in Rio every day and Bolsonaro is our salvation." In February, the army was put in charge of security in Tijuca, but Ms Uberaba thinks it has not made much of a difference. "I think the armed forces and police need to be better equipped to be able to compete with this violence. We can't cope with it anymore." When Workers' Party candidate Luiz InÃ¡cio Lula da Silva became president in 2003, there was huge hop e he would change the country. Lula governed during a time of great economic growth and millions of people were lifted out of poverty with help from his government-run social programmes. But the good times did not last and Brazil fell into the worst recession in its history, from which it is only slowly emerging now. Lula was found guilty of corruption and is serving a 12-year prison sentence. His Workers' Party successor in office, Dilma Rousseff, was impeached for illegally manipulating the government budget. This has led to a lot of ha tred towards the Workers' Party. TomÃ© Abduch, who owns a construction company in SÃ£o Paulo, is one of those who is fed up. "We can no longer have a leftist government in Brazil, it destroyed our country," he says. "It put corrupt people in positions of power in Brazil and corruption is one of the biggest reasons why Brazil has failed to develop. "Bolsonaro has a very clear and transparent way of doing politics. He's run a completely impartial campaign, he's not accepted public money or money from businesspeople, so he's been able to run a campaign that's completely free of any compromises or political agreements," he says. As Jair Bolsonaro has risen in the polls, so too have Brazilian stocks. Investors see the far-right candidate as a safer pair of hands than his left-wing rival Fernando Haddad. Leo FraÃ§Ã£o is a wealthy Brazilian businessman from Porto Alegre. He runs an investment fund focused on Brazil and has also donated $3.77m (Â£2.9m) to fund the military police of Rio Grande do Sul. Thanks to his donation, they now have Glock pistols and better body armour. 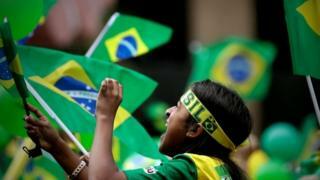 "Brazil is probably the wealthiest country in the whole world, by natural means," he says. "You don't need to be a miracle performer to build a huge economy, you just need the government out of the way." He says that Mr Bolsonaro is the only candidate with the guts to make the changes he wants to see. "He is the first person that says that criminals should to go to jail," he says. Mr FraÃ§Ã£o says he also has great trust in Mr Bolsonaro's economic adviser, Paulo Guedes. "I don't need a genius to run my country, I just need someone with initiative not to mess it up," he concludes. Evangelical Christians - who make up 29% of all Brazilians - have been one of the groups who have supported Mr Bolsonaro in greatest numbers. According to the latest Datafolha poll, 61% of evangelicals will cast their vote for him in the run-off on Sunday. Mr Bolsonaro himself describes himself as Roman Catholic, but his Christian rhetoric and his slogan "Brazil above everything, God above all" have won over many in the evangelical community. Luceni Alves is a presenter on Radio Relogio, an evangelical station in Rio de Janeiro. "He believes in the word of God and in my principles," she says. "He's against the legalisation of abortion because that goes completely against God's word. He's also against the legalisation of drugs." Ms Alves is also critical of what she calls the "sexualisation of children". "The Bible says God made man and woman and in my opinion, gender ideology confuses children, it deconstructs what God built," she says. During the campaign, Mr Bolsonaro alleged that the rival Workers' Party had handed out "gay kits" in schools, something he strongly criticised. He was referring to a Workers' Party plan to launch a "Brazil without homophobia" programme in schools. As part of the programme, material to promote respect for diversity and end discrimination was designed for teachers. The material was never distributed and Brazil's Superior Electoral Court debunked talk of the "gay kit" as fake news. Nevertheless, it continued to be a talking point with Mr Bolsonaro's supporters such as Ms Alves. 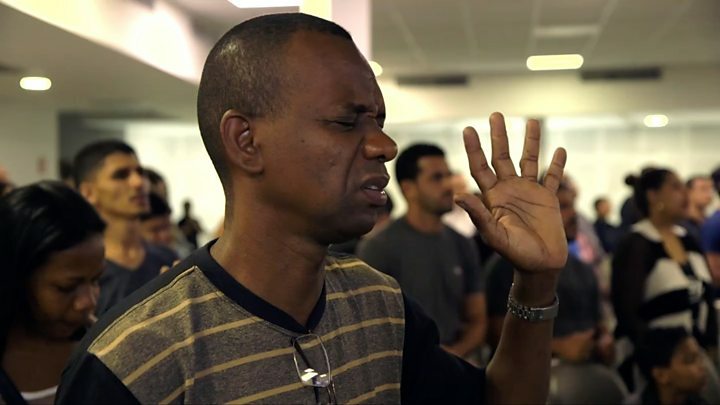 "It's totally against biblical principles and Bolsonaro agrees with me, so he represents me." "He's a candidate who respects God," she says. "A person who doesn't respect God respects nobody." Brazil's farming lobby, which represents the country's powerful agribusiness sector in Congress, earlier this month endorsed Mr Bolsonaro as president. Alessandro Fernandes Pimenta is landowner who keeps cattle, pigs and chickens in Goiana in central Goias state. "I'm fed up with these shameless corrupt politicians," he says. "At the moment if you want to develop land, it's really bureaucratic. I wanted to but it's impossible. Bolsonaro wants to cut taxes and make things less bureaucratic." "The government talks about environmental protection but doesn't do anything to make things better. There has to be a bigger incentive," he explains. Additional reporting by Tatiana Polastri.